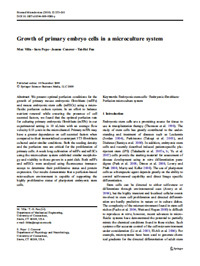 Villa, M.M., Pope, S.E., Conover, J.C., & Fan, T.-H., Growth of primary embryo cells in a microculture system. 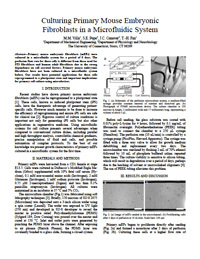 Biomedical Microdevices 12, 253-261 (2010). 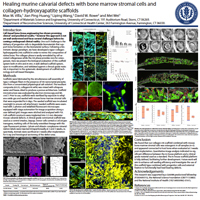 Villa, M.M., Huang, J.P., Wang, L., Rowe, D.W., and Wei, M., Healing Murine Calvarial Defects with Bone Marrow Stromal Cells and Collagen-Hydroxyapatite Scaffolds, Biomaterials & Tissue Engineering Gordon Research Conference, Holderness, NH, USA, 2013. 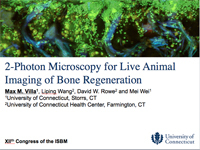 Villa, M.M., Wang, L., Rowe, D.W., and Wei, M., 2-Photon Microscopy for Live Animal Imaging of Bone Regeneration, The XIIth Congress of the International Society of Bone Morphometry, Minneapolis, MN, USA, Oral presentation, 2012. 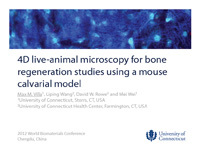 Villa, M.M., Wang, L., Rowe, D.W., and Wei, M., 4D Live-animal microscopy for bone regeneration studies using a mouse calvarial model, World Biomaterials Congress, Chengdu, China, Oral presentation, 2012. 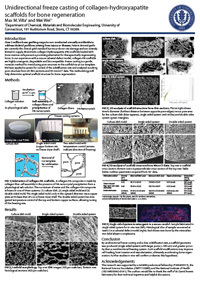 Villa, M.M., and Wei, M., Unidirectional freeze casting of collagen-hydroxyapatite scaffolds for bone regeneration, Materials Research Society Fall Meeting, 2011 Best student poster award. 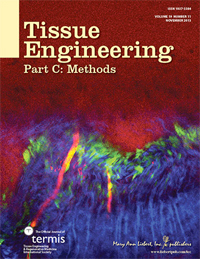 Villa, M.M., Pope, S.E., Conover, J.C., & Fan, T.-H., Culturing primary mouse embryonic fibroblasts in a microfluidic device. 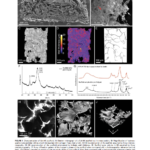 IEEE 35th Annual Northeast Bioengineering Conference Proceedings (2009).